This delicious recipe uses Waitrose Beef Olives, which are rolls of thinly sliced topside of beef, stuffed with pork and mushrooms. Slow cooked in a red wine sauce, they are tender and full of flavour. Secure the beef olives with cocktail sticks. Heat the olive oil in a frying pan and seal the beef olives. Transfer to a small roasting tin or baking dish. Add the butter to the pan, followed by the sliced onions. Cook gently for five minutes and add the sugar, some salt and pepper. Continue frying for a further 10-15 minutes or until golden brown. Add the carrot and finally the red wine. Simmer for a couple of minutes, then pour over the beef olives. Cover with tinfoil and cook in a preheated oven 150ºC, gas mark 2 for 1-½ - 2 hours or until tender. Remove the cocktail sticks. 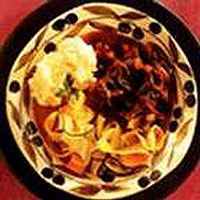 Serve with noodles or mashed potatoes and ribbons of vegetables.